The second preview of the upcoming e-book ‘Home Remedies’ is ready for you to see. Just uploaded it before shooting this mail to you. I guess, I am excited. All the jigsaw pieces seem to be falling in place. This book required a lot of extra effort. You know that this is not the first time I am composing an e-book, but this one has taken so much out of me. But still there is a sense of fulfillment that I was able to create something useful for you. I don’t know whether you are sharing my excitement, but I am almost jumping up and down like a kid. I know I should not behave like this, but what to do? For a change, I won’t divulge what I have added to the upgraded ‘Preview 2’. You find out and tell me and please let me know your opinion. A few brickbats would help me cool down my excitement, I guess. Everybody likes their own creation, don’t they? Right here, waiting for you. While preparing dinner at a friend’s place this weekend, a thought about chicken crossed my mind (because I was making Butter Chicken). 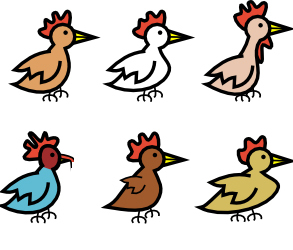 Did you know that chickens have different classification types? You have heard the terms “broiler”, “fryer” and “roaster” used in describing chickens, but you may have thought that they were just interchangeable adjectives. But actually, there are many terms used to describe chickens that are based primarily on their age and weight. After further research, I also learned that the best method for cooking a chicken depends on the type. This is due to the ratio of surface area to volume of the chicken. Smaller chickens have less volume in comparison to their surface area, so heat enters more quickly into the bird but there is less meat to cook. Therefore, faster methods of cooking like frying are recommended for them. Larger chickens on the other hand have much more volume and need more time to cook. Since their surface area is relatively smaller, this means that a slower method is necessary in order not to burn the surface, which is why slow roasting is recommended. Broiler – These are 2 to 3 months old and are 1.5 to 2.5 pounds. The best methods for cooking them are broiling, grilling, or roasting. In addition to the quicker methods being necessary due to the ratio of the birds’ volume to surface area, quick methods are needed for broilers since their skin is more tender. A slower method of cooking (particularly in a liquid) would cause the delicate skin to become dry and stringy. Fryer – These are 3 to 5 months old and usually weigh 2.5 to 3.5 pounds. It is best to fry, saute, roast, fricassee, or poach them. When you purchase pre-cut chickens, they are often fryers or broilers. Roaster – These are normally older chickens that weigh 4 to 6.5 pounds. Since they take longer to reach their final point, they also tend to be more expensive. As you learned above, the best ways to cook larger birds are slow methods. You should roast, poach, or fricassee them. For those of you who are more sophisticated eaters, there is also squab. Squab is a baby chicken weighing 0.75 to 1 pound, and it is best to cook them via broiling, grilling or roasting. On the other end of the scale, there are Capon and Caponette chickens. These are specially fed castrated male roosters (yes, you read that right) that are usually 4 to 7 pounds. They are known for being tender, juicy and flavorable. It is best to roast, poach or fricassee them. Juan was driving down a country lane in his pickup when suddenly a chicken darted into the road in front of him. He slammed on his brakes, but realized that the chicken was speeding off down the road at about 30 miles an hour. Intrigued, he tried to follow the bird with his truck, but he couldn’t catch up to the accelerating chicken. Seeing it turn into a small farm, Juan followed it. To his astonishment, he realized that the chicken had three legs. Looking around the small farm, he noticed that ALL of the chickens had three legs. Currently I am compiling a book on ‘Home Remedies’. For common ailments we rush to the doctor and stuff ourselves with all kinds of medications, when we can easily get that ailment treated without any need to step out of the house. Our kitchen is a powerhouse, as far as conjuring up culinary delicacies is concerned and also for conjuring up miraculous cures for some common ailments.The pantry is packed with so many ingredients which have amazing healing properties, we just need to be aware of those. I began working on this book six months ago and am presently on the verge of completion. Had to put in a lot work…going to libraries, reading books and journals, consulting Ayurvedists, trying to get tips from grannies and nannies etc. Mid way, I had to change the structure of the book as the volume of content increased unexpectedly. To let you know what exactly I am doing, I shall show you few progressive previews of the e-book during the coming days. I am providing just three sample diseases and their home remedies in the first preview. There are a lot more diseases and remedies to be added very soon.